Amphibians are an unusual group of cold blooded vertebrates that comprise the taxonomic class Amphibia. They include varieties ranging from frogs to salamanders to caecilians and around 6,500 species found throughout the world. Amphibians are very similar to reptiles, but they are not amniotes, meaning they do not have terrestrially adapted eggs. Most of them lay their eggs in water and have very unique skin that aid in respiration under water. Two American Toads (Bufo americanus) in amplexus, the larger female on the bottom, the smaller male on top, mate in a shallow catchwater basin at Montezuma Audubon Center. Reproduction in Amphibians occurs between the male and female through sexual reproduction. All lay eggs, usually in the water and fertilization in most is external. The male will usually take the amplexus pose (see picture at left) where the male releases its sperm over the females eggs. The male frog is normally smaller and gets on top of the female frog. The salamander on the other hand releases a packet of sperm called spermatophore. Then the female will pull it off the ground into her cloaca where the fertilization occurs internally. This can happen where it deposits the sperm right into the females intromittent organ. Amphibians can be found in ponds, streams, wetlands, and usually in any rural forest area. The animals stay in warm humid conditions because that is where they are great in numbers and diverse. Amphibians remain active all year round in wet tropics, but in temperate areas they become inactive because of the cold temperature. In autumn they strive the best because it drives them to muddy ponds for hibernation. When conditions get too dry, though, most frogs and salamanders bury themselves to stay moist. Amphibians have another way of avoiding desiccation by covering its skin with a waxy substance. The coat then provides waterproofing to lower the frog's rate of water loss. Amphibians are also known for the loud noises you hear when you go by a pond. Only males can croak and make noise to call to the females. It is a part of a mating process. On the other hand salamanders are lead to each other by chemical cues and complex courtship behaviors. When the amphibian is not mating, it will eat anything it can fit in its mouth. The amphibians range from very fast eaters to slow and deliberate. Most frogs are known for using there tongue to catch small prey and swallow them whole. Since they can not chew most animals then use there legs to stuff it down their throats. Sometimes toads pull their eyeballs into their skull to help swallow the food. Most amphibians feed on invertebrates and a few small vertebrates. Frogs play a big role in the population of mosquitoes and the reduction of diseases. Since there are so many mosquitoes in the world and all of them are spreading diseases to humans and animals. Both frogs and salamanders have a knack for mosquitoes after previous study to show that most of the food they eat are flies. The frogs use their massive tongues to catch the mosquitoes easily. ↑ Amphibia Unknown Author, Wikispecies, 23 December 2010, at 22:15. ↑ Amphibian Unknown Author, Wikipedia, 25 February 2011 at 02:13. ↑ Amphibian William E. Duelman, Encyclopedia Britannica , Access 2/27/11. ↑ Circulation Unknown Author, 2011 Encyclopedia Britannica, Inc, Access Date February 03, 2011. ↑ Anatomy of a Frog Gaynor Borade, Buzzle.com, Access Date February 3, 2011. ↑ Reproduction Paul Hebert, EOA earth, Access date Tuesday 25, January 2011. 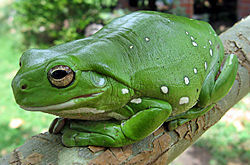 ↑ Amphibian Unknown Author, Wikimedia Foundation, Inc, 3 February 2011. ↑ 8.0 8.1 Amphibian ecology and evolution Paul Hebert, Environmental Information Coa, August 29, 2008, 2:02 pm. ↑ Amphibian predation on larval mosquitoes Sarah E. DuRant, 2011 Microsoft corporation, Accessed Date 2/27/11. ↑ Frog Unknown Author, Wikimedia, 17 February 2011 at 20:00. This page was last modified on 31 May 2016, at 17:18.